A charming, gold Estella Bartlett XO Necklace with separate ‘X’ and ‘O’ charms will work wonders with any outfit. This fine gold chain is embellished with two charms: a gold plated ‘X’ and a gold plated, and cubic zirconia encrusted ‘O’. The perfect gift for a loved one, a close friend or just for yourself, you can now keep hugs and kisses close to your heart all the time. Worn on it’s own as a statement piece or layered with other gold or silver necklaces, the piece would be a versatile and exquisite addition to any jewellery box. 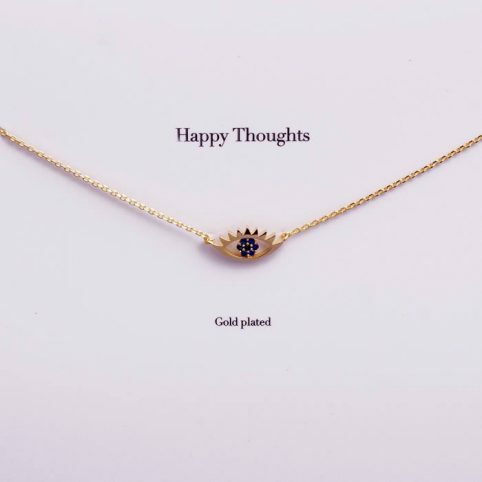 The necklace comes sold in a beautiful, ombréd package, with the words ‘Positive Vibes’ written across the top. The packet also contains an envelope, so it is an excellent buy for those quick gift ideas without the fuss. The necklace has adjustable lengths and measures between 20 and 23cm in length. For similar necklaces by Estella Bartlett why not check out our Estella Bartlett Gold Plated Lucky Necklace, Estella Bartlett Elephant Necklace, or Estella Bartlett Eye Pendant Necklace. Categories: Accessories, Fashion Accessories, Gifts For Her, Gifts From £10 - £20, Jewellery, Necklaces, NEW, Personal Accessories, Valentine's Day Gifts.